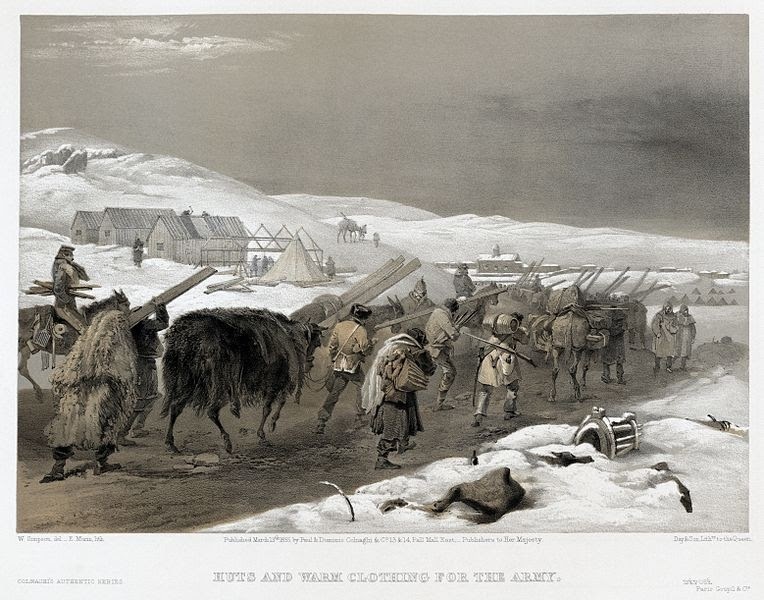 William Simpson: Crimean War - Huts and Warm Clothing for the Army. Print shows soldiers transporting winter clothing, lumber for huts, and other supplies through a snow-covered landscape, with partially buried dead horses along the roadside, to the British camps; huts under construction in the background." Tinted lithograph, digitized from the original print. March 13, 1855. Library of Congress. (Copied from French Wikipedia). Click to enlarge. Leo Tolstoi: Valitut kertomukset 1 / [Leo Tolstoy: Selected Stories 1]. Translator: Juhani Konkka. Introduction: Mikko Kilpi. Helsinki-Porvoo: WSOY, 1963. On my trip to Russia I had Leo Tolstoy's Sevastopol Sketches as my travel reading, topical this week as Russia occupied and annexed Crimea, which had belonged to Ukraine since 1954. The rest of the world condemned the occupation as a breach of international law, and the annexation was not recognized by the international community. The Sevastopol connection inspired me to read this entire volume of the earliest stories by the young Leo Tolstoy, himself a veteran of the wars in Caucasus and the Crimea. The stories are fresh and modern in the same way as stories belonging to the Ernest Hemingway school, and there are also affinities with the New Journalism and the trend of the non-fiction novels of the 1960s. Tolstoy has even been called the pioneer of war journalism. Striking features of the Sevastopol stories include - an in medias res approach - they seem to be based on first hand observation - a sober, unflinching realism - characters are portrayed via action and dialogue. Stendhal was Tolstoy's model in the representation of war, and Turgenev in the representation of Russian reality, but evidently Tolstoy's own experiences provided the compelling sense of urgency which is distinctive to these war stories. These are not tales of heroic feats. The Russians are beaten, and we witness an entire gamut of weaknesses: vanity, cowardice, corruption, gambling. Despite all this there is a sense of an invincible patriotic spirit. The unique grandeur of Tolstoy is already evident in these stories of youth. It has been said that if life could speak, it would speak like Tolstoy. The great paradox is Tolstoy's obsession with death. Nobody has faced death more bluntly. Very soon in the first Sevastopol story we are taken to the field hospital, to the desperately wounded and amputated war invalids, to the awful, dizzying stench. The second Sevastopol story Tolstoy ends with the remark that the hero he is trying to portray is nothing but the truth. The third Sevastopol story expands to an epic vision of society, of bureaucracy, ambition, careerism, and cowardice. We follow the tragic path of two brothers, an experienced one and a novice, as Sevastopol falls. There are also four earlier stories stemming from the military experience in the Caucasian wars, including in Chechnya. The Raid is the tale of a young volunteer in his first combat. The Wood-Felling ventures to discuss questions of "why we fight": different types of soldiers and their reasons to risk their lives in Chechnya. The Snowstorm is an account of a desperate journey somewhere around Don, not far from Novocherkassk. Two Hussars is a more lightweight yarn about the reckless life of hussars of two generations, father and son. Elaborating the death theme, a pantheistic story called Three Deaths features a dying woman of the world and a dying old driver, both infected by tuberculosis. And finally a tree felled, to make a wooden cross out of it. Tolstoy's first povest (a long short story, a novella, 150 pages in this volume) is called Family Happiness, told by a female first person narrator. (The three first tales are by a male first person narrator, and the rest by a third person narrator, presumably male.) It is a Bildungsroman of a teenage girl who falls in love with a man 19 years older than she. It is a psychologically sensitive account of the education of love, the expression of love, the disillusion with the original love experience, and the new perspective of motherhood. I glanced a little bit at what has been written about this tale, and the accounts do not even seem to get the basic facts right. For me, this story is about growing up in love, from romantic imagination to a realistic facing of the facts of life. It's about opening one's eyes to life. Tolstoy, himself, was disappointed with Family Happiness, but it is amazing that he wrote such a story when he himself was still unmarried. Three years later he married Sophia, 16 years his junior. Tolstoy's first stories, including the Sevastopol tales, were written from the perspective of youthful male bravado. Family Happiness is a volte-face, written from the perspective of a romantic, sensitive teenage girl who has lived a protected life in the countryside. Of Tolstoy's masterpieces, one can discover interesting links to War and Peace in the Sevastopol stories and beginnings of Anna Karenina's female psychology in Family Happiness. The laconic, pervasive sense of death, stunning and unforgettable in Hadji Murat, is also already present in these earliest tales of Tolstoy. Tolstoy has a unique sense of humour. He did not write funny stories or comedies like Chekhov often did. But he has an omnipresent humoristic world view. We are always aware of the comme il faut - the ideal, the purpose, the meaning, the destination, the grand design, the war strategy, the marriage facade. Nothing ever goes according to plan. Tolstoy finds delight in the fact that life is stronger than the plan.